For the longest time I’ve wanted to use an airbrush in my painting. For large model kits and terrain they are indispensible. I’ve only had a working airbrush since Christmas, the used brush I’d bought years ago didn’t perform. After getting the fittings I needed to connect my Iwata Neo with a used Badger compressor I was looking forward to trying it out. What better way than by using it on my Deadzone terrain. I’ve already written about a great article on painting Deadzone terrain but now that I’ve done it myself I thought I’d share my experiences. It’s strange to use an airbrush, an unfamiliar tool, after so many years with a paintbrush. A paintbrush I understand and feel very comfortable with. Not so an airbrush. There were a couple of times when it was misbehaving and I had no idea why. By telling you where I went wrong hopefully you can avoid some of my mistakes. Obviously before painting the terrain needs to be assembled. As I’ve mentioned before, Deadzone terrain needs to be glued together for the best results. It’s more stable than relying on a friction fit and the terrain isn’t really suited for being assembled and disassembled repeatedly. It’s hard enough when it is unpainted. I don’t think I could stand to put the heavy pressure needed to snap the connectors in onto something that I’ve spent time painting. Smaller structures use less material and cover more table. Some people might suggest painting the terrain before assembly, or even on the sprue. While this is certainly makes painting each panel easier it is really important to test your terrain setup before finalizing it. I assembled my terrain and played a couple of games. From those games I was able to make some informed choices about how I wanted the terrain to be assembled. I feel that smaller structures that can be pushed together to create larger structures is the best way to go. 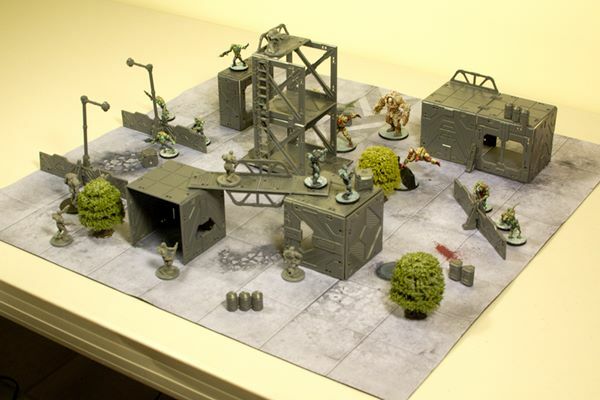 Here are some tips for assembling the terrain. Put some miniatures inside during the test run and measure line of sight. The panels with the single small windows don’t give LOS if the window is positioned closer to the top than the bottom. Don’t put floors in any structure at ground level. Floors make things harder to stack. Don’t put flat connectors on the top of any roofs. For the same reason as no floors, they get in the way of stacking. A simple cube is the most basic structure. I like to only use three walls, one of which must be an entry point (large window or door) and it should be next to the missing panel. This way there are no straight lines of sight through any buildings. Large structures use many panels and don’t provide as much coverage as smaller structures spaced out on the board. Unfortunately for me I learnt these rules the hard way, especially the ones about floors and flat connectors on roofs. I plan on picking up at least one more terrain set at some point and the worst issue, flat connector on a roof, only effects one building. Vallejo Surface Primer is my current favorite primer. I use it to brush-prime my miniatures and my first airbrush experiments involved priming models with the stuff. It is used straight from the bottle both with a brush and when spraying. Some airbrushes will need to have the air pressure and tip size increased to properly shoot the thicker primer. Vallejo Makes lots of different primer colours. I prefer White, Black and Grey. I have white, grey and black primer. For this application I used black. This way I could leave some in the crevices for shading and not have to worry about reaching every little corner on the inside of the terrain. I wasn’t planning on painting the insides beyond a quick spray of my shadow colour. Vallejo recommends applying the primer from 20cm away. I’m not sure about this as I’ve found it can leave a rough surface if it dries before it hits the model. Still, laying down a very light coat will prevent the surface tension of the primer from pulling it away from edges. Although you can apply multiple coats at any stage Vallejo’s primer takes at least 24 hours to cure. Until then it is as fragile as a normal acrylic paint. If you will be masking you run the risk of the tape peeling away the primer until you let it fully cure. I like to wait at least 48 hours after priming, more if I want to sand any imperfections. Now that we’ve primed our models let’s look at adding paint chips. Previous story Why Does Acrylic Paint Chip?